The origin of language (glottogony) is a topic that has attracted considerable speculation throughout human history. The use of language is one of the most conspicuous and diagnostic traits that distinguish Homo sapiens from other species. Unlike writing, spoken language leaves no trace. Hence linguists have to resort to indirect methods in trying to decipher the origins of language. Linguists agree that there are no existing primitive languages, and all modern human populations speak languages of comparable complexity. While existing languages differ in the size of and subjects covered in their lexicons, all possess the grammar and syntax needed, and can invent, translate, or borrow the vocabulary necessary to express the full range of their speakers' concepts. All humans possess similar linguistic abilities, and no child is born with a biological predisposition favoring any one language or type of language. Human language had emerged by the transition to behavioral modernity some 50,000 years ago at the latest (Upper Paleolithic). A common assumption is that behavioral modernity and the emergence of language coincide and are dependent on one another, while others would push back the origin of language to some 200,000 years ago, the time of the appearance of archaic Homo sapiens (Middle Paleolithic), or even into the Lower Paleolithic, to some 500,000 years ago. This question significantly depends on the view taken of the communicative skills of Homo neanderthalensis. In either case, a lengthy stage of pre-language, intermediate between Great ape language and fully developed human language, needs to be assumed. It is necessary to make a minor distinction between speech and language. Speech involves producing sounds from the voicebox. Talking birds, such as some parrots, are able to imitate human speech with varying ability. However, this ability to mimic human sounds is very different from the acquisition of syntax. On the other hand, the deaf generally do not use speech but are able to communicate effectively using sign language, which is considered a fully-developed, complex, modern language. What this implies is that the evolution of modern human language required both the development of the anatomical apparatus and also neurological changes in the brain. Though all animals use some form of communication, researchers generally do not classify their communication as language. However, the communication systems of a few animal species do share some attributes in common with modern human language. Dolphins, for example, are able to communicate like humans by calling each other by name. Not much is known about great ape communication in the wild. Like human infants, the anatomical structure of their larynx does not enable apes to make many of the sounds that modern humans do. In captivity, apes have been taught rudimentary sign language and the use of lexigrams—symbols that do not graphically resemble their corresponding words— and computer keyboards. Some apes such as Kanzi have been able to learn and use hundreds of lexigrams. However, apes appear to lack the ability to learn grammar and syntax. For example, syntax allows modern humans to differentiate sentences that have nearly identical structure but entirely opposite meanings, such as, "John chased Jane" and "Jane chased John." Kanzi, on the other hand, who might have memorized the meaning of symbols representing "Jane", "John", and "chase," would likely be unable to identify who was chasing whom. In the wild, the communication of vervet monkeys has been the most studied. They are known to make up to ten different vocalizations. Many of these are used to warn other members of the troupe about approaching predators, and include a "leopard call", a "snake call", and an "eagle call". Each alarm triggers a different defensive strategy. Scientists were able to elicit predictable responses from the monkeys using loudspeakers and prerecorded sounds. Other vocalizations may be used for identification. If an infant monkey calls, its mother turns toward it, but other vervet mothers turn instead toward that infant's mother to see what she will do. There is considerable speculation about the language capabilities of ancient hominids. Some scholars believe the advent of hominid bipedalism around 3.5 million years ago would have brought changes to the human skull, allowing for a more L-shaped vocal tract. The shape of the tract and a larynx positioned relatively low in the neck are necessary prerequisites for many of the sounds humans make, particularly vowels. Other scholars believe that, based on the position of the larynx, not even the Neanderthals had the anatomy necessary to produce the full range of sounds modern humans make. Still another view considers the lowering of the larynx irrelevant to the development of speech. tense, aspect, auxiliary verbs, etc. That is, a stage in the evolution of language somewhere between Great ape language and fully developed modern human language. The term Hmmmmm has been proposed for the pre-linguistic system of communication used by archaic Homo (beginning with Homo ergaster and reaching the highest sophistification with Homo neanderthalensis. Hmmmmm is an acronym for holistic (non-compositional), manipulative (utterances are commands or suggestions, not descriptive statements), multi-modal (acoustic as well as gestural and mimetic), musical and memetic. Anatomical features such as the L-shaped vocal tract have been continuously evolving as opposed to appearing suddenly. Even though archaic humans used crude stone technology, it was still more advanced than that of chimpanzees or gorillas. Hence it is most likely that archaic humans possessed some form of communication intermediate between that of modern humans and that of other primates. The recent (in 2007) discovery of a Neanderthal hyoid bone suggests that Neanderthals may have been anatomically capable of producing sounds similar to modern humans, and studies indicate that by 400,000 years ago the hypoglossal canal of living hominids had reached the size of that in modern humans. The hypoglossal canal transmits nerve signals to the brain and its size is said to reflect speech abilities. Hominids who lived earlier than 300,000 years ago had hypoglossal canals more akin to those of chimpanzees than of humans. However, although Neanderthals may have been anatomically able to speak, Richard G. Klein in 2004 doubted that they possessed a fully modern language. They largely base their doubts on the fossil record of archaic humans and their stone tool kit. For 2 million years following the emergence of Homo habilis, the stone tool technology of hominids changed very little. Richard G. Klein, who has worked extensively on ancient stone tools, describes the crude stone tool kit of archaic humans as impossible to break down into categories based on their function, and reports that Neanderthals seem to have had little concern for the final form of their tools. Klein argues that the Neanderthal brain may have not reached the level of complexity required for modern speech, even if the physical apparatus for speech production was well-developed. The issue of the Neanderthal's level of cultural and technological sophistication remains a controversial one. Anatomically modern humans first appear in the fossil record 195,000 years ago in Ethiopia. But while modern anatomically, these humans continued to behave like the hominids who existed before. They used the same relatively crude stone tools and hunted less efficiently than did modern humans within the past 50,000 years. However, beginning about 100,000 years ago, there is evidence of more sophisticated behaviour, and by 50,000 years ago fully modern behaviour is thought to have developed in various parts of Africa. After this point, stone tools show regular patterns that are reproduced or duplicated with more precision, and tools made of bone and antler appear for the first time. The artifacts are also now easily sortable into many different categories based on their function, such as projectile points, engraving tools, knife blades, and drilling and piercing tools. Teaching offspring or other group members how to manufacture such detailed tools would have been difficult without the aid of language. The greatest step in language evolution would have been the progression from primitive, pidgin-like communication to a creole-like language with all the grammar and syntax of modern languages. Many scholars believe that this step could only have been accomplished with some biological change to the brain, such as a mutation. It has been suggested that a gene such as FOXP2 may have undergone a mutation allowing humans to communicate. Evidence suggests that this change took place somewhere in East Africa around 100,000 to 50,000 years ago, which rapidly brought about significant changes that are apparent in the fossil record. There is still some debate as to whether language developed gradually over thousands of years or whether it appeared suddenly. According to the Out of Africa hypothesis, around 50,000 years ago a group of humans left Africa and proceeded to colonize the rest of the world, including Australia and the Americas, which had never been populated by archaic hominids. Some scientists believe that Homo sapiens did not leave Africa before that, because they had not yet attained modern cognition and language, and consequently lacked the skills or the numbers required to migrate. However, given the fact that Homo erectus managed to leave the continent much earlier (without extensive use of language, sophisticated tools, nor anatomical modernity), the reasons why anatomically modern humans remained in Africa likely had more to do with climatic conditions. Linguistic monogenesis (the "Mother Tongue Theory") is the hypothesis that there was one single protolanguage (the "Proto-World language") from which all other languages spoken by humans descend. All human populations from the Australian aboriginals to the Fuegians living at the Southern tip of Chile possess language. This includes populations, such as the Tasmanian aboriginals or the Andamanese, who may have been isolated from the old world continents by as long as 40,000 years. Thus, the multiregional hypothesis would entail that modern language evolved independently on all the continents, a proposition considered implausible by proponents of monogenesis. All humans alive today are descended from Mitochondrial Eve, a woman estimated to have lived in Africa some 150,000 years ago. This raises the possibility that the Proto-World language could date to approximately that period. There are also claims of a population bottleneck, notably the Toba catastrophe theory which postulates human population at one point some 70,000 years ago was as low as 15,000 or even 2,000 individuals. If it indeed transpired, such a bottleneck would be an excellent candidate for the date of Proto-World, which also illustrates the fact that Proto-World would not necessarily date to the first emergence of language. Some proponents of a Proto-World hypothesis, such as Merritt Ruhlen, have attempted to reconstruct the Proto-World language. However, most mainstream linguists reject these attempts and the methods they use (such as mass lexical comparison) for a number of reasons. Research found strong support for the idea that verbal language and sign language depend on similar neural structures. Patients who used sign language, and who suffered from a left-hemisphere lesion, showed the same disorders with their sign language as vocal patients did with their spoken language. Other researchers found that the same left-hemisphere brain regions were active during sign language as during the use of vocal or written language. Our ancestors started to use more and more tools, meaning that their hands were occupied and could not be used for gesturing. Gesturing requires that the communicating individuals can see each other. There are many situations in which individuals need to communicate even without visual contact, for instance when a predator is closing in on somebody who is up in a tree picking fruit. The need to co-operate effectively with others in order to survive. A command issued by a tribal leader to 'find' 'stones' to 'repel' attacking 'wolves' would create teamwork and a much more powerful, co-ordinated response. Humans still use hand and facial gestures when they speak, especially when people meet who have no language in common. Deaf people also use languages composed entirely of signs. A pidgin is a simplified language that develops as a means of communication between two or more groups who do not share a common language, in situations such as trade, whose vocabulary is generally derived from languages of the various groups. The manner in which pidgins develop is of interest in understanding the origin of human language. Pidgins are significantly simplified languages with only rudimentary grammar and a restricted vocabulary. In their early stage pidgins mainly consist of nouns, verbs and adjectives with few or no articles, prepositions, conjunctions or auxiliary verbs. The grammar consists of words with no fixed word order and the words have no inflectional endings. Studies of creole languages around the world have suggested that they display remarkable similarities in grammar and are developed uniformly from pidgins in a single generation. These similarities are apparent even when creoles do not share any common language origins. In addition creoles share similarities despite being developed in isolation from each other. syntactic similarities include Subject Verb Object word order. Even when creoles are derived from languages with a different word order they often develop the SVO word order. Creoles tend to have similar usage patterns for definite and indefinite articles, and similar movement rules for phrase structures even when the parent languages do not. Since children are largely responsible for creolization of a pidgin, scholars such as Derek Bickerton and Noam Chomsky concluded that humans are born with a Universal grammar hardwired into their brains. This universal grammar consists of a wide range of grammatical models that include all the grammatical systems of worlds' languages. The default settings of this universal grammar are represented by the similarities apparent in creole languages. These default settings are overridden during the process of language acquisition by children to match the local language. When children learn a language they first learn the creole-like features more easily than the features that conflict with creole grammar. Another issue that is often cited as support for the Universal grammar theory is the recent development of Nicaraguan Sign Language. Beginning in 1979, the recently installed Nicaraguan government initiated the country's first widespread effort to educate deaf children. Prior to this there was no deaf community in the country. A center for special education established a program initially attended by 50 young deaf children. By 1983 the center had 400 students. 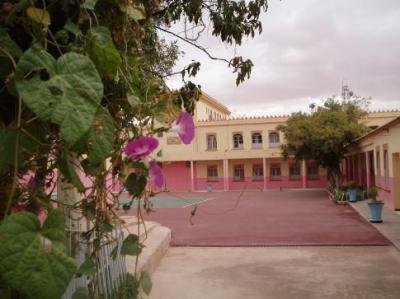 The center did not have access to teaching facilities of any of the sign languages that are used around the world; consequently, the children were not taught any sign language. The language program instead emphasized spoken Spanish and lipreading, and the use of signs by teachers limited to fingerspelling (using simple signs to sign the alphabet). The program achieved little success, with most students failing to grasp the concept of Spanish words. The first children who arrived at the center came with only a few crude gestural signs developed within their own families. However, when the children were placed together for the first time they began to build on one another's signs. As more younger children joined the language became more complex. The children's teachers, who were having limited success at communicating with their students, watched in awe as the kids began communicating amongst themselves. Later the Nicaraguan government would solicit help from Judy Kegl, an American sign-language expert at Northeastern University. As Kegl and other researchers began to analyze the language, they noticed that the young children had taken the pidgin-like form of the older children to a higher level of complexity, with verb agreement and other conventions of grammar. The search for the origin of language has a long history, rooted in mythology. Late 18th to early 19th century European scholarship assumed that the languages of the world reflected various stages in the development from primitive to advanced speech, culminating in the Indo European family seen as the most advanced. Modern linguistics does not begin until the late 18th century, and the romantic or animist theses of Johann Gottfried Herder and Johann Christoph Adelung remained influential well into the 19th century. The question of language origins proved inaccessible to methodical approaches, and in 1866 the Linguistic Society of Paris famously banned discussion of the origin of language, deeming it to be an unanswerable problem. A systematic approach to Historical linguistics became only possible with the Neogrammarian approach of Karl Brugmann and others from the 1890s, but scholarly interest in the question has only been gradually re-kindled from the 1950s (and then controversially) with ideas such as Universal grammar, mass lexical comparison and glottochronology. "Origin of language" as a subject of its own emerges out of studies of neurolinguistics, psycholinguistics and human evolution in general. The Linguistic Bibliography introduces "origin of language" as a separate heading in 1988, as a sub-topic of psycholinguistics, with dedicated research institutes of evolutionary linguistics emerging in the 1990s. Both the medieval monarch Frederick II and Akbar, a 16th century Mughal emperor of India, are said to have tried a similar experiment; the children involved in these experiments did not speak. 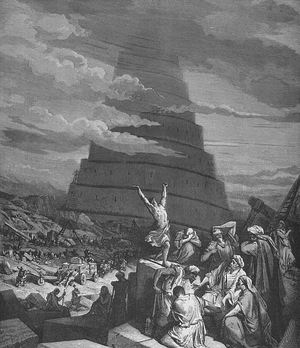 According to Genesis, the observed variety of human languages originated at the Tower of Babel with the confusion of tongues. (Image from Gustave Doré's Illustrated Bible). Religions and ethnic mythologies often provide explanations for the origin and development of language. Most mythologies do not credit humans with the invention of language, but know of a language of the gods (or, language of God), predating human language. Mystical languages used to communicate with animals or spirits, such as the language of the birds, are also common, and were of particular interest during the Renaissance. One of the best known examples in the West is the Tower of Babel passage from Genesis in the Bible or Torah. The passage, common to all Abrahamic faiths, tells of God punishing man for the tower's construction by means of the confusion of tongues (Genesis 11:1–9). Local variations of this passage are found to have followed Christian missionaries on their journeys across the world, although the extent to how much of the tradition existed prior to the arrival of the missionaries is still discussed.